It’s been 3 days since I started this challenge and I feel that it is going very well. I was hoping to get my family on-board with me but unfortunately you can lead a horse to water but you can’t make him drink! It is not deterring me as I am set on being more of a food purist and am tired (literally) of eating food that makes me feel bloated and sleepy! 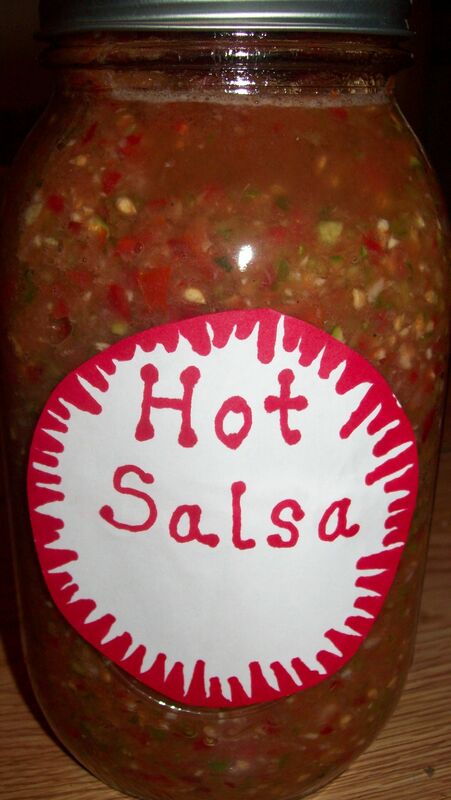 One of the first things I did was make spicy salsa. I wanted to have it on hand for when something was too bland and needed kicking up a bit! 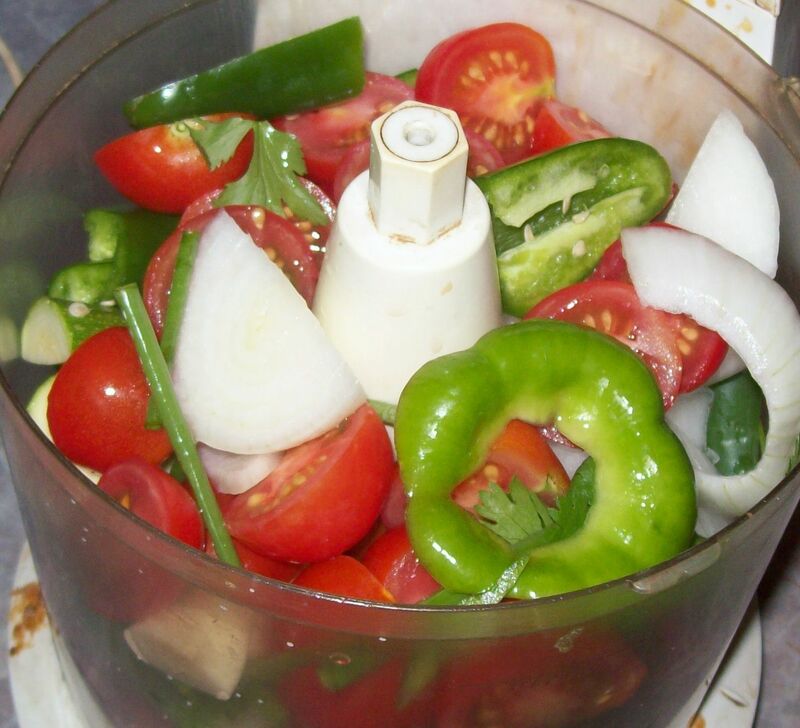 It has tomatoes, onions, garlic cloves, garlic chives, small zucchini, green and red bell peppers, jalapeno peppers, cilantro, cumin, salt, and a squirt of lime juice! For lunch that day when everyone was eating potato chips and bologna and cheese sandwiches on white bread, I made this for myself! 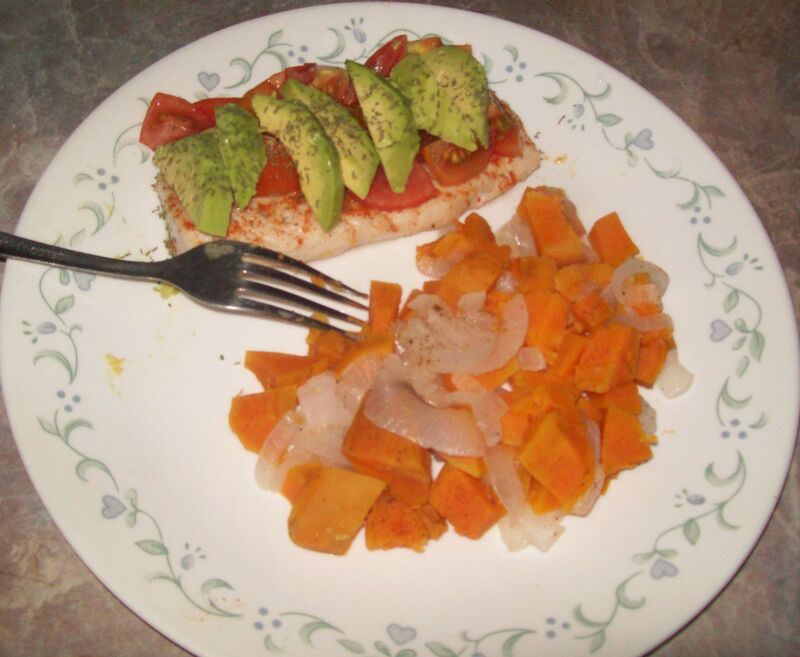 Grilled and spicy fish topped with fresh tomatoes, avocado slices, and dill. I paired it with steamed sweet potatoes and onions. It was very tasty! BUT…look what I made for me! Delicious fried green tomatoes. I made them by breading them in seasoned oatmeal that I powderized in my food processor. Then I gave them a drizzle of olive oil and baked them for about 30 minutes. 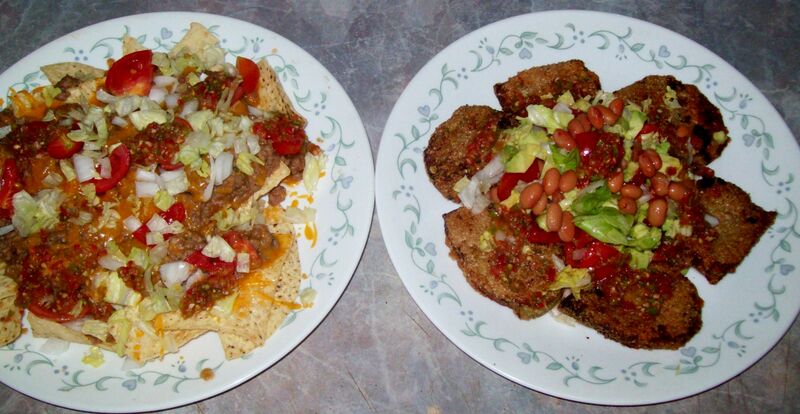 In the center I used pinto beans, lettuce, tomatoes, onions, salsa, and guacamole. I didn’t even miss the cheese or chips! 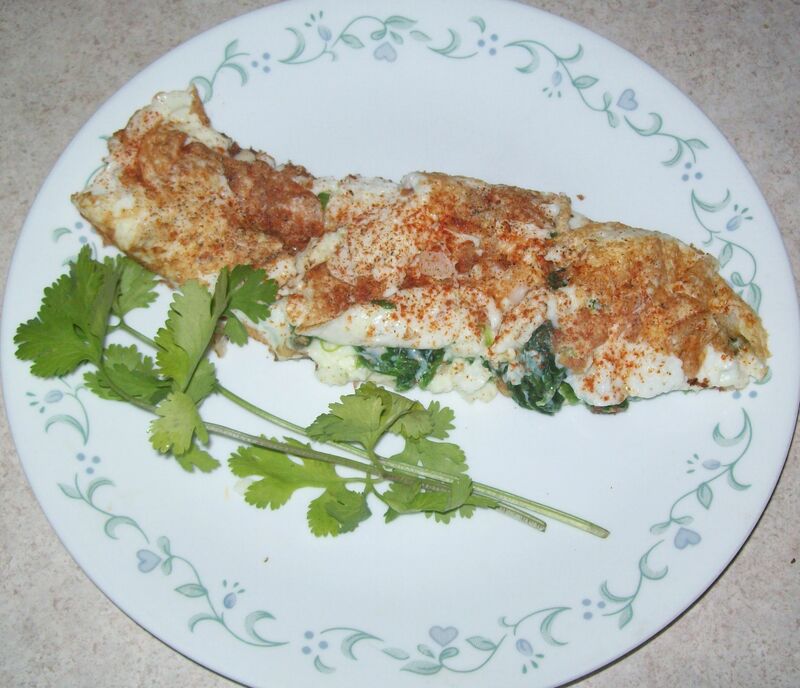 The next morning I made an organic egg white omelet. It has spinach, onions, home made mozzarella, and lots of cayenne pepper. I made the mozzarella using organic 1% milk, vegetable rennet, lemon juice, a crushed vitamin C tablet, and salt. I will post later exactly how this is done. 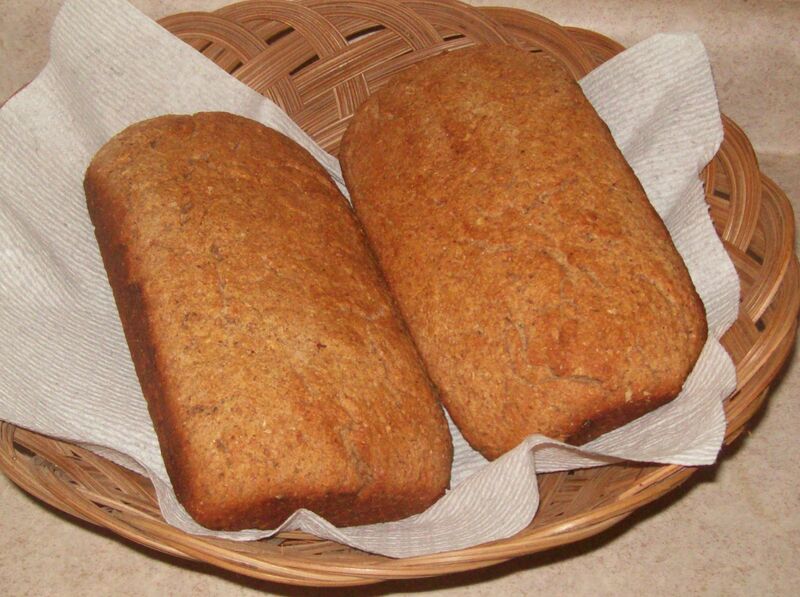 I was really starting to crave bread by this point so I knew I would have to quit being lazy and make some! I used quite a few ingredients for this bread including the leftover whey from making the cheese. Whey contains the water-soluble proteins, vitamins, and minerals in the milk, so it’s a shame to just throw it out! To the whey (about 3 ½ cups), I added yeast, soy flour, brown rice flour, oatmeal, milled flax seed, bran flour, whole wheat flour, extra virgin olive oil, and salt. I didn’t measure anything (sorry). But I just kneaded the dough until it formed a ball and could rise a bit. The dough was quite sticky and took a LONG time to rise because of not having any white flour in it. 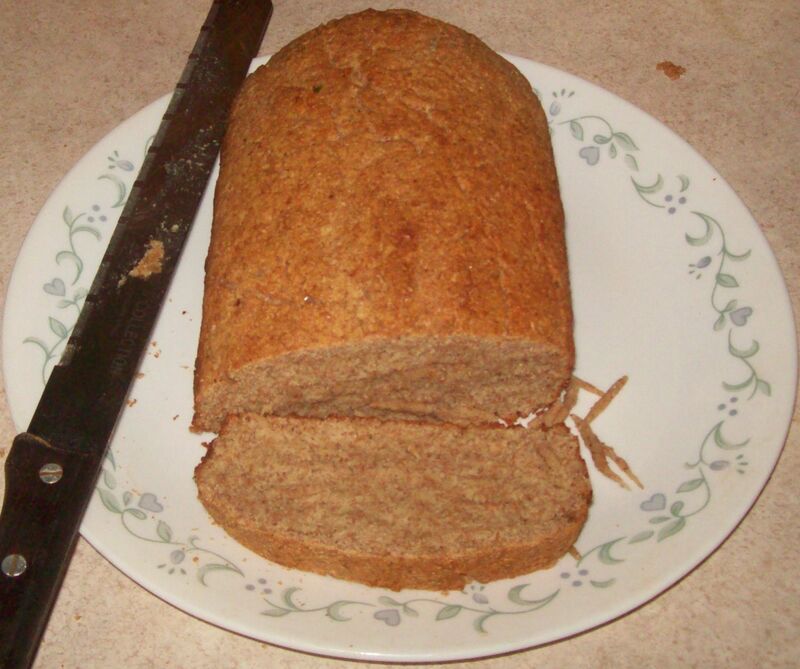 It turned out very good for a healthy, dense, and filling bread! For another dinner I made the family pork chops, mashed potatoes and gravy, canned corn, and buttered bread. For my version, I made mock meat (a vegetable patty), using egg white, soy flour, spinach, mushrooms, onions, salt, pepper, and chopped garlic. On the side I had mashed sweet potatoes (I used almond milk to make them nice and creamy), and steamed broccoli and mushrooms. It was incredibly yummy! For dessert my husband made chocolate ice cream from scratch. He used a ton of egg yolks, heavy cream, and sugar. Everyone was raving about how wonderful it was so I had to think of something quick to resist temptation! I made something really decadent that tastes similar to an Almond Joy candy bar. In a large zip-lock bag I added cocoa powder, honey, slivered organic almonds, and shredded organic unsweetened coconut. I mashed it around making sure it was all coated and mixed thoroughly. I coated my hands in olive oil and rolled into balls. Then I set them in the freezer for about an hour. They definitely satisfied my chocolate craving and made it possible to watch them eat my husband’s famous ice cream! Baby steps. Meatless Mondays perhaps. Posted by Createityourself on July 26, 2012 in Cooking and Baking, Plants and Gardening and tagged almond joy, baking, cooking, diet, eating right, Fish, fried green tomatoes, grilling, health, healthy eating, making cheese, mock meat, mozzarella, pure foods, salsa, vegetarian. Thanks for the encouragement! Yes, I really do hope it catches on! While I wholeheartedly agree with your food choices (apart from the egg-white only omelette) – there is no way I would have passed on home made chocolate ice cream! 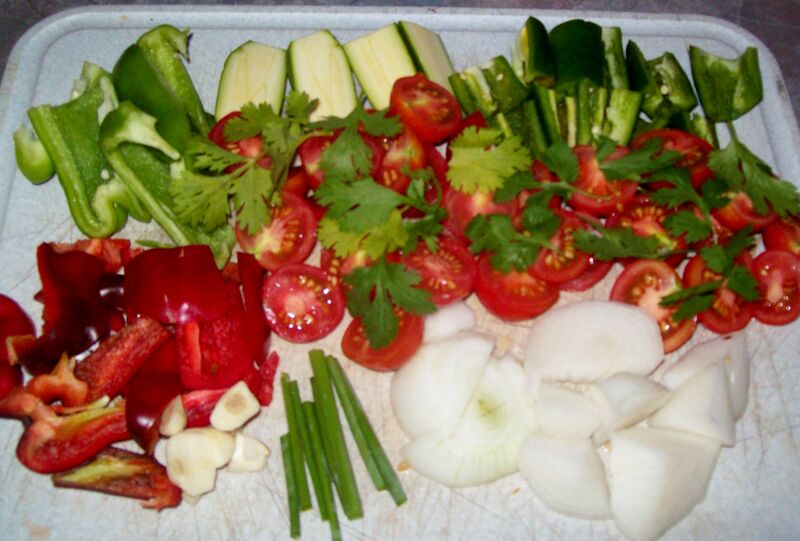 I’ve used the opportunity that both husband and daughter were away for 2 weeks, and had veggie and salad based dishes all the time – and all veggies and salads were from the garden. But I cannot do without dairy products – but then, you get great cheese and fresh milk in France. I have to say that I am missing really rich flavorful cheese the most! Thanks for commenting! You’re going to be spoiled on all of this good food and never want to go back to preservatives! I hope so. I also hope it makes me a tad bit more energetic. Spoiled can be a good thing sometimes! Good for you!! You go!! Thanks for the motivational cyber support, I appreciate it! Wow these are such awesome choices – and yummy – one of my favourite veges is mashed sweet potato, in fact I just mashed 2kg of it about 20 minutes ago before reading this lol. I add tuna to it for a high protein low GI super yummy snack (with Himalayan rock salt). How do you feel about raw? I’m moving towards 51% raw minimum each day (slowly of course!) so I have started making my own almond milk which I love more than any other milk actually, I made some raw bikkies last night, and I have been researching meals just haven’t gotten around to making any. Thanks for the cyber support! I feel great about raw foods, but i’m not sure I could handle it at 51%. I love that you are making your own almond milk! I’m looking forward to seeing what raw meals you make. I have seen some raw lasagna that looks pretty good! Yes, sometimes the men and kids in our lives just are not quite ready to think “healthy”. But us ladies need to take care of ourselves so that we can continue to care for those we love! Maybe we can set an example by making our food extra tasty and yummy looking so that they will want some of what we are having!